Various sewing projects. Mostly historical (or historically inspired) stuff. Varying levels of ambition! I skipped the #6 challenge (Fairy tale) and this is still a sort of in-between lazy challenge, since my UFO is very unfinished indeed. I have some photos of the process, too, but to be fair a bonnet isn't all that complicated, so here goes. 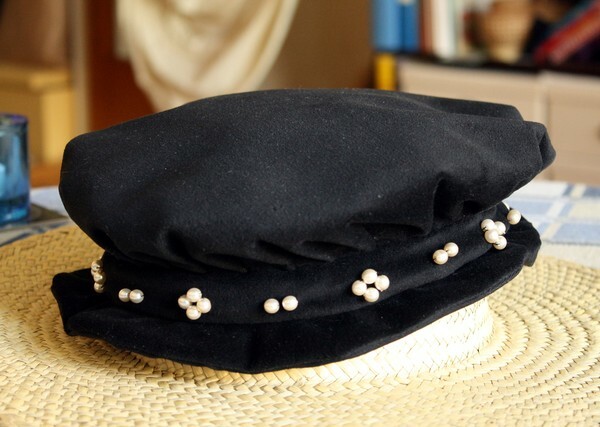 I do like bonnets, and a black one seems to be useful for a lot of styles. Including later Venetian ones (I think using it with the Venetian gown from last challenge is cheating, but I still did it!) as well as Elizabethan. And velvet was slightly more fancy than wool. Polyester velvet, thin wool for lining. Fairly. I trust the TT for accuracy, and the only actual shortcut is the velvet. Entirely hand-sewn, so 80% with penalty for not using proper silk velvet? About 8. The pleating of the crown always takes more time than I expect. 30th of March, for photo session at Kalmar castle. I had the luxury of time, since I skipped the fairy tale challenge. About $15 for half a yard of velvet (though it had been in my stash for a year); wool, pearls and thread from stash. Forester with all sorts of geeky interests, among them historical clothing and larping. I was one of those who'd never do silly slashed garments and poofy Renaissance, proof that one should never say "never"! I have HA ambitions which mostly have to stand back for time, money and sanity issues - which means that I have a wardrobe of not-quite-good-enough dresses. Other interests include drawing, reading, (forest) history and dancing.